Who would not have Thailand in their bucket list? I did, for sure. Still, I never thought I’d go somewhere else than Bangkok or Phuket. 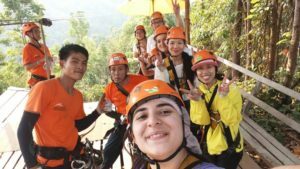 When my lovely travel mate Hazal told me that Northern Thailand was also amazing, I had no idea how I glad I was going to be after this route change. Being the second largest city of Thailand, Chiang Mai is the most “Thailand” city in Thailand that I’ve travelled. 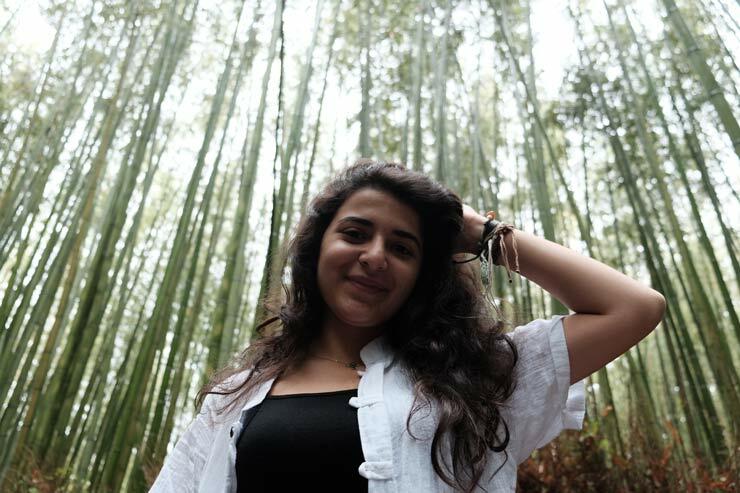 It is not too touristy yet a heaven for backpackers; not too crowded yet full of amazing people to meet. I can say with all my heart that, if I ever make my way to Thailand again, it will be for Chiang Mai once again and more of Northern Thailand. The language is Thai which is written in the most beautiful alphabet in the world, and the currency is Thai Baht which will make you quite happy when you see the currency rates. Here I want to go in a very deep philosophical discussion about how ethical being a tourist in Thailand is but… nah, not now. Chiang Mai is full of temples and monuments thanks to its history of being the capital of several former kingdoms founded in the country. Since we expected to see a lot of temples in Bangkok, we honestly skipped that part and got a bit adventurous. 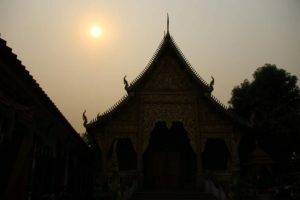 What I recommend you for Chiang Mai is spending at least a week to get the hint of “chilling in Chiang Mai” so that you don’t get upset as we did while leaving. If your time is gonna be limited, you should skip the sightseeing already since you’ll get enough of temples and stuff in Bangkok. Before starting, I unfortunately forgot how much we paid for the whole trip, since it was organized by one person 😀 What I remember: for half day cooking class, it should be 800 Bahts. 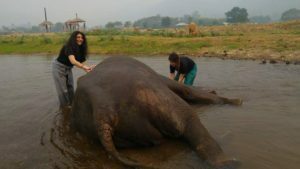 Elephants, zipline and Chiang Rai should be around 1000-1500 each Bahts, everything included from transportation to lunch. Before even booking our flight, a friend who had spent 2 entire weeks in Chiang Mai recommended us the hostel he stayed in. We honestly were grateful considering Thailand’s reputation about dirtiness, rats, cockroaches and anti-touristy stories. So we took it. After reading this blog post, if you wanna contact this guy, Jack, just ping me on Facebook or comment on Instagram etc and I’ll give his contact to you as well as more information. Jack’s place is called Budget & Boutiqe Guesthouse which is no longer registered to booking.com. Apparently he works on word-of-mouth 😀 His place is a very decent hostel that you can find bunk bed or private rooms with air conditioning, or super cheap rooms with fans which he does not really recommend during spring&summer. We booked an entire 6 beds bedroom for 3 people, literally paid almost nothing compared to a bed in a hostel room in Europe, and let Jack organize the activities we want for our very limited time in the city. Jack is a super friendly and caring person, he even took us out on a night to his favorite bar. But if you want to find your own place, I could at least recommend staying near the place we stay. 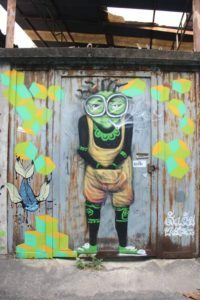 The streets around our hostel were full of hostels, lovely restaurants, hippie cafes, amazing murals and also were very close to markets, ATM, main road, best bars in the city and even to night market which can be a nice 20 minutes walk if you don’t wanna take a jeepney. 18 Terrace Guesthouse was one of the loveliest hostels that I saw around but their comments online are not very promising 😀 Just pick a place around this hostel you can find online, (I guess the area is called Sri Phum) spend as much time as you can wandering around these streets, discovering best of murals, have some nice cold drinks in the lovely cafes and do not hesitate meeting new people who probably has as interesting stories as yours ! WHEN & HOW TO GO? Chiang Mai has a very convenient airport but flights to Chiang Mai from other countries are almost double price of flights to Bangkok, simple demand-supply. So it is better if you land in Bangkok, and then take a train or bus to Chiang Mai. Some people I met in the hostel did that and they said it was quite good. Considering night trains in Vietnam, I could say that first class tickets are not that bad and Thailand is not a dangerous country in the territory in terms of trusting transportation companies. In my second visit, I will definitely give a try to railway in Thailand ! If you book beforehand, your hostel would definitely help you for tickets or at least guide you about how to buy via e-mail. I think to myself, what a wonderful world! Arriving at the hotel very early in the morning, we could not feel full of energy until we hit the fresh fruit shake shop on the corner of the street. Literally, the one at the beginning of the street that my hostel was on, is THE BEST FRUIT SHAKE I’ve ever tasted in Thailand, Cambodia and Vietnam (so lets say at least 20 fruit shakes) Try banana&coconut&milk with some additional syrup if you like sweet stuff. That made my breakfast. Jack scheduled zipline for us on the first day. I had never heard about zipline before my trip to Thailand but apparently nowadays it is almost in evereywhere. But in case you don’t know, it is basically releasing yourself from one side of a cable by holding a strong steel pulley and get to the other side of the wire and playing the monkey from one giant tree to the other. I’ve always envied actors and actresses escaping from a building by doing that since my childhood so think how ready I was for flying! The one we went was called Skyline Adventure. They picked us up from the hotel, and after a long journey in the jungle of giant trees, we arrived at the facility where we were surrounded by safety equipment. Super-friendly staff of Skyline showed us how to hold the pulley and release ourselves but imagine how we feel at that moment, obviously you think it would not be any easy when you are tens of meters higher than the ground. A bunch of young Chinese people, my friend and I, on a wooden platform on top of a tree looking down the hill… No worries, there is always someone from the staff at each end, so once you are brave enough to release yourself for the first time, you’ll see that it is super easy and fun! You’ll quickly pick your “favorite staff” depending on their amazing performance on the cable wire and their jokes 🙂 Zipline is not just that cable trip but also many challenging games with jumps, climbing, free falls and adrenaline so you better be sportive that day. 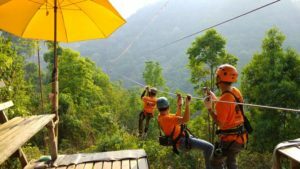 After almost 2 hours of adventure, they take you to the longest and final cable of the whole parkour which is 900 meters long being the longest and highest zipline in the biggest rain forest of Chiang mai, Thailand. That moment in my life… There is no way I can forget it. I literally felt like I was facing the sun, flying my wings wide open and free more than any bird ever was. Flying is so much fun at every cable but that final one has the best view for sure. While we were having lunch which was included in the tour, I was wondering how next days could get any better than that day. 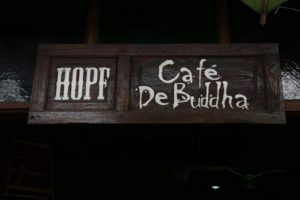 After a very “moving” afternoon, we spent some time resting in a nice cafe called Cafe de Buddha, drinking our fancy cold coffees and watching very few people on the street at that time of the day. When the night falls and you start feeling hungry, there is only one thing you need to do : hit the streets! 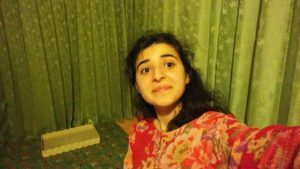 Seriously, I spent 10 days in total in Thailand and I remember going in a restaurant only like… twice maybe? 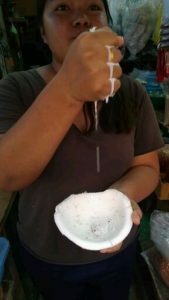 Street food is the real food culture in Thailand and if the first thing appears in your mind is not quite attractive when I say street food, either prepare yourself for a trip full of challenge by all means or enjoy the way your prejudice disappears. 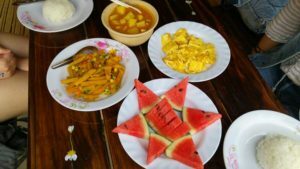 Thailand cuisine is one of my favorites. Sometimes it is too sweet, sometimes too spicy and sour but still it has very delicious dishes that you can not imagine that their ingredients do even exist or can come together on a plate. At your first night in Chiang Mai, take a jeepney to the night market, check out the stalls and start with the very basics : pad thai and roti ! Best pad thai I tasted was in Chiang Mai, but it was the one I cooked (we’ll come to that) but in terms of roti, the one I tested in Chiang Mai night market is the best with no doubt. Roti is a very thin layer of pastry fried on a hot sheet metal with a filling you pick. Well, original filling is banana and egg. Sounds weird right? I am telling you, it is SO DELICIOUS. They also have all this Nutella and stuff but forget about it and go Thai, but not denying your touristy roots. Take your phone and send a Snap to all your friends while the lady behind the stall mixes the banana slices with raw egg and cooks them on the pastry layer. Waiting for customers ! Or not really? Night market in Chiang Mai is slightly cheaper than the ones in Bangkok and Phuket. We were very prepared for buying super cheap t-shirts, bags, Thai pants with elephants… You can spend very little amounts of money on very cool stuff and the variety in the market is unbelievable. 3 things that I could not find in the other cities’ night markets : 1) the guy who makes passport folders of your own design and color choice, in front of your eyes 2) t-shirts with chiang mai name on 3)short skirts with colorful geometric patterns on. 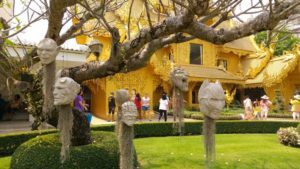 Other than that, do not lose yourself too much into shopping if you will be travelling any other place like Bangkok, Phuket, Hanoi, Siem Reap… so that you get the same thrill every where. 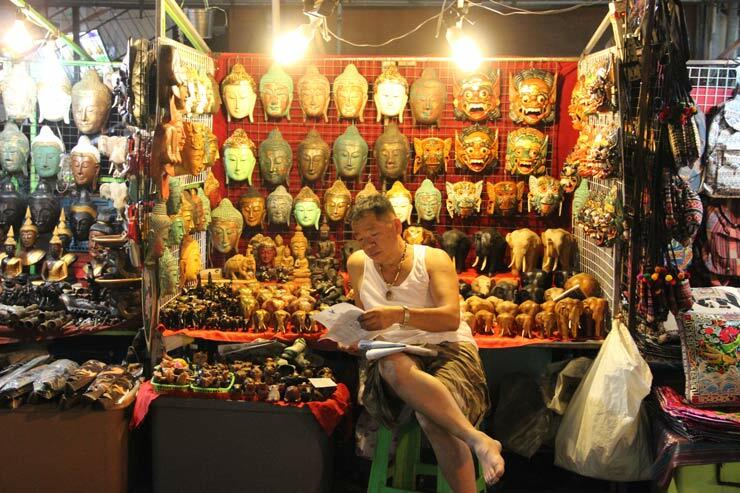 Night markets are quite vibrant and watching people rather than shopping is more of an experience. Please see “bargaining” section to complete your background for night markets. What can be a better option? A candidate is THAI MASSAGE. Thailand is the massage talent export capital of the world with no doubt. Pick a place of your choice, pay 1/5 of the money you’d pay in your country, select a back&shoulders massage. We went to the one just in front of our hostel on Jack’s recommendation and really felt refreshed after a 1-hour massage. Massage is a bit more expensive in Bangkok and Phuket so try every one of them while you are in Chiang Mai until you find your favorite ! We went back from the night market to the hostel at around 10 PM to be able to wake up at 5 AM in the morning for the elephants! 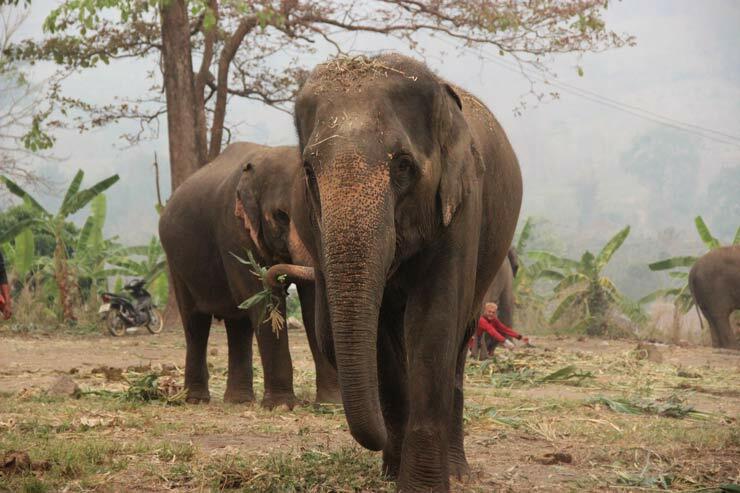 Elephants have been a major attraction for Southeast Asian countries and an issue for animal activists. Here is my opinion, I of course do not support torturing any of these animals to tame them enough for their human fans. On the other hand, a reason that these countries are amazing that they are very cheap, serve whatever they have for tourists to enjoy and usually over hospitable for you sometimes even making you feel weird. So this is actually us travelers benefiting from these lands’ people who have been taught to tame themselves for serving and serving and serving better for Westerners. So should we not even go and see these countries since it makes us a part of that system? My mind set was somewhere in the middle of being selfish and being sensitive. I have not visited tiger parks since I obviously see these wild cats are drugged so bad for you to have a selfie next to them. For elephants, there was no chance that I could resist myself when it comes to looking an elephant’s beautiful eyes so we wanted to go to an elephant camp that is as nature-oriented as possible. Woody’s Elephant Camp staff gave us some clothes to go in the river comfortably. You better wear something like Crocs sandals, if you don’t want to go in the river with bare foot because the staff does not recommend you to wear flip flops on the way to river. Magdo and I have some problems. There is a part that you ride the elephant in Woody’s, and honestly I can not really imagine myself walking down to river from Woody’s on that super steep path hidden in a jungle. They put no seat on the elephant, it is basically you struggle to not to fall, even scream when the elephant starts going down the steepest parts with no hesitation; and if you have a rebel like my friend Magdo the Elephant, it is very likely that he would go to the grass fields around without even noticing you were afraid of losing other people and being the most-stupid-tourist-ever-kidnapped-by-an-elephant. 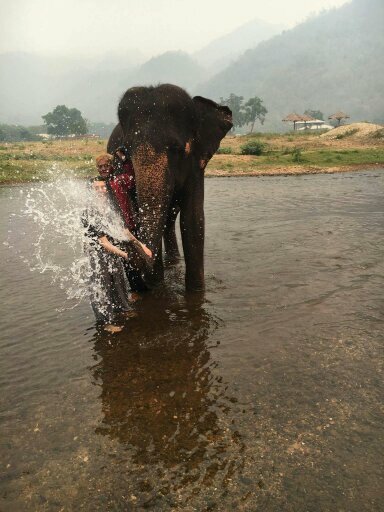 After the elephants, we had lunch in the Woody’s and went back to the hotel for a quick shower before Thai cooking class! This one was the most unexpectedly wonderful experience in my trip. We were signed up for Asia Scenic Cooking Class’s afternoon session with a bunch of tourists from Germany, Canada, US, Taiwan and Austria. Our cooking teacher first took us on the local bazaars to introduce different spices, dried food and noodle types used in Thai cuisine as well as oil, sauces, and other weird stuff. After that each of us picked what we want to cook from the menu and got on business in the kitchen. Thai ingredients are complicated, require you to be fast and feel the right amount but at the end you see that it is mixing and stirring and mixing and stirring and voila! I cooked pad thai, spring rolls, red curry paste and minced chicken salad. All the time you spend discovering the ingredients and recipes make you feel like a little child doing a lab experiment. I definitely recommend Asia Scenic Cooking Class because of their motto “cook with emotion” is the basic rule of everything in the kitchen 🙂 They will also give you a complimentary cooking book of all the Thai food on their menu. What we did on our second and last night was discovering the city’s more vibrant part: bar district. To be honest Phuket and Bangkok are more competitive when it comes to nightlife but Chiang Mai is such a backpackers’ heaven that having fun here is so casual. 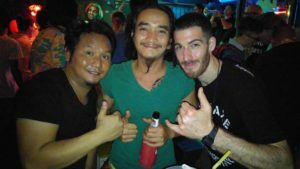 Jack took us and a bunch of other people from the hostel to a bar shows how “reggae” it is from miles away 🙂 There was a Thai live band playing best reggae songs and everyone started dancing on the floor. Jack is the one on the left, fyi! Two friends we met in the cooking class also joined us. Bar district is quite packed, one street away from this super chill bar, there is a night club where they pour cold water from hoses on the people who already got in the mood by deep house music. There is no way I can describe how alive Thailand nights make you feel, come and see yourself! 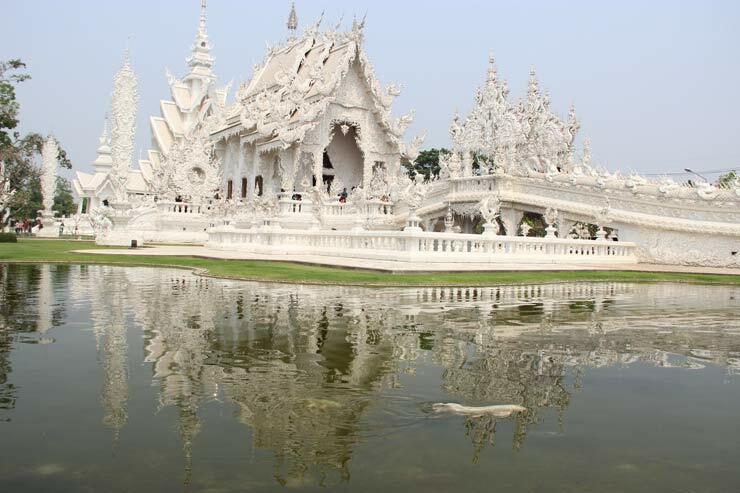 Before going to Chiang Mai, I saw a picture of Wat Rong Khun, aka White Temple, and promised myself to see if this building really exists or not. Being a modern art masterpiece, this temple is built in 1996 on a combination of traditional Thai architecture and the satire of brilliant architects who literally buried a meaning in every detail of the temple. Exterior design is somehow gothic with hundreds of outreaching arms that you pass by a bridge and leave all those mortal desires to where they belong to. After crossing the bridge and entering the gate of the temple you see the interiors of the temple: all walls are covered with popular culture icons, war scenes and politicians. Architects depict them as reasons of this planet becoming worse every single day. Might seem a bit exaggerated, well I think at least Michael Jackson has nothing to do with it 😀 But still, a very courageous idea. 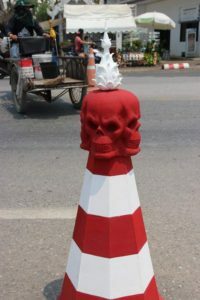 Chiang Rai is a city of contemporary art, by all means. Hold on a sec, I haven’t mentioned how to go right? This temple is in Chiang Rai which is only 1-2 hours away from Chiang Mai. We took a tour to see both White and Black Temple which are the two contemporary art masterpieces combining tradition and the popular culture in one of a kind buildings. 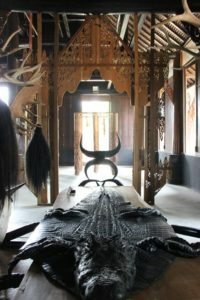 Black Temple is a complex of buildings with interior design inspired by Medieval European and Nordic tribes with gothic dinner tables and Game of Thrones looking-like items while the exterior is a perfect combination of Nordic wooden ships and traditional Thai temple architecture. We had no idea what Black Temple was before going, and then liked it as much as we did White Temple. Being surprised with these two contemporary art approaches, I felt even bad discovering my primitive thoughts about not expecting any modern art from Thai art community. Apparently they even get more creative and combine their tradition with modern art rather than copying western modern art. After spending our last day on these two surprising Thai delights, it was time to leave Chiang Mai for out flight to Bangkok. Had a fruit shake, wrote some postcards, wandered around the streets for the last time and finally said goodbye to Jack before getting on a tuktuk. Are you bad at bargaining ? Well, good luck then. 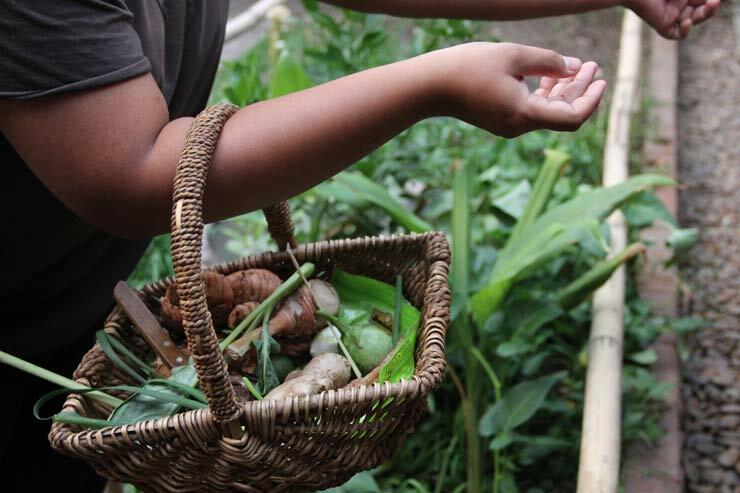 Southeast Asia is very welcoming for tourists as long as you have a very “touristy” mind set. Your friends who’ve been to Thailand, the receptionist at your hotel, and even people you’ll meet on the plane will tell you one single thing “ALWAYS BARGAIN FOR SOMETHING YOU’LL PAY” This is not applicable to Seven Elevens, for sure. But whenever you buy a souvenir from the night market or food from some stall that does not write its price down on somewhere; always ask for the price as if you are just wondering. If it sounds expensive, just leave as if it is too expensive or claim you’ve found it half price somewhere else. I know it sounds cruel and you may think this is the only way those people make money. But there is already a vicious circle you have to accept: local people set prices higher, tourists know that and bargain, since tourists think that they always have to bargain local people think they always have to offer an expensive price first, so on and on… They might even get mad at you if you offer a very low price than the product really deserves. So better smile all the time, rather than arguing just say it is too much and see if he or she would try to stop you once you intend to leave the stall or the shop. Not only shopping but also tours you purchase are also something you need to bargain. Since we knew the guy who organised everything for us, we were already on a discount. I don’t recommend you to book the tour right away via your hotel reception. There is always a better price in the city. Ask for discount if you are a group of people, or ask more agencies if you have enough time before purchasing any tour. 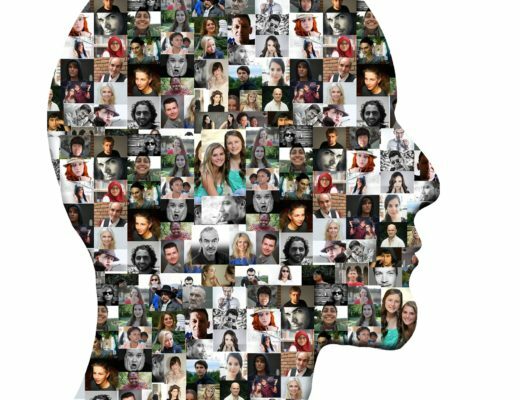 If you feel like you are not supporting enough the people in need, I’d recommend you to give tips to people who really helped you during the activity because at the end you can’t monitor how much of the money you pay to the company goes for their labor. Chiang Mai airport does not take more than 30 mins to anywhere in the city. When you book a tour, lets say zipline, they take you from and drop off at the hotel. 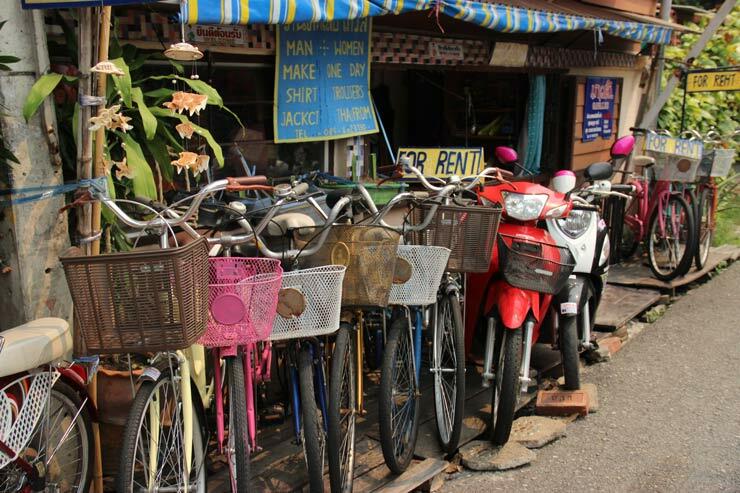 You can walk on foot basically to everywhere or just rent a bike and enjoy feeling some wind on your skin, thankfully Chiang Mai bike traffic is not as crazy as it is in Vietnam and Cambodia. To go to night market, we preferred jeepneys which are old jeeps transformed into minibuses. You can also take a tuktuk, which I won’t describe but just share this photo* to tell you what it is 😀 Always bargain before getting on to a jeepney or a tuktuk or a taxi because there is no taximeter or a set price for any of them. This is gonna be more crucial if you make your way down to Bangkok, since you need to take a tuktuk or a taxi more often in that big of a city.